Kerala SSLC Result 2019 for the Class 10 students will be announced soon, as per the latest reports coming from the Kerala Pareeksha Bhawan. The Kerala State Education Board is expected to declare the 10th Kerala Results 2019 on time as per the annual academic calendar followed by the Board. As of now, the Kerala Board has refrained from announcing any official release date for the SSLC Result 2019. However, experts suggest that the Class 10 Kerala Board Result 2019 can be expected by 1st week of May. As per tentative reports, the Kerala Board has already begun making the necessary arrangements for the declaration of Kerala 10th Class Result 2019. Keeping in mind the convenience of the students, the Kerala SSLC Result 2019 will be declared online on the official website of the board. Students will be able to access and check the outcome of their year-long hard work in the form of SSLC Result 2019 online at keralaresults.nic.in. On the result day, the Kerala Board 10th Result 2019 will be uploaded on the official website- results.itsschool.gov.in or kbpe.org. JagranJosh for the convenience of students will be sharing a link in this article for easy access to the Kerala SSLC Result 2019.Students are advised to bookmark this page to receive latest news and updates on the Kerala Board 10th Result 2019. Read on to know more about the Kerala Board Result 2019. The students who will appear for the Kerala SSLC Examinations can expect their results to be announced in the first week of May, 2019. However, these are the tentative dates and cannot be taken as final one unless the board confirms it. The students advised to bookmark this page and check it regularly since we will be updating all the latest notifications from the Kerala Board here. Our team is constantly monitoring all the latest updates and media reports on Kerala Board 10th Result 2019. For the convenience of the students, we will be making the Kerala SSLC Result 2019 accessible on this page as well. How to check Kerala Board 10th Result 2019? The previous year’s statistics are crucial for students appearing for the Kerala SSLC board exams. As the scores in the Kerala Board 10th Result 2019 will depend upon the individual performances in the Kerala SSLC Examination 2019. Nevertheless, the students can get an idea of the expected scores by evaluating the statistics of last year's result. With tensions rising among the students, a simple way to calm the nerves would be to look at the result stats of last year. This data will help the students understand the strictness and evaluation standards followed by the examiners to check the answer sheets. It also helps students build right and realistic expectations with regards to Kerala Board 10th Result 2019. For this purpose, we have provided the key statistics of last year's SSC Result below. 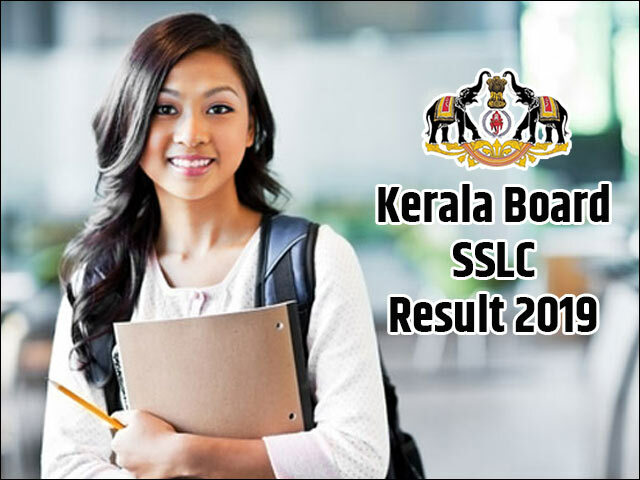 Kerala Board SSLC Result 2019 will bring both good and bad news. While some may be celebrating the outcome of their hard work, there will be some disappointed with their performance. Such students should not lose hope and take it as an end to their future. In case the students do not feel that their efforts have been truly justified in the scorecard, they can apply for re-checking / re-evaluation of the answer sheets. In case there is any change in the final mark tally, the same would be updated in the original mark sheet. Most of you have a tendency of comparing the marks with one another. Especially the parents of the top meritorious students compare their children's marks. They also decide about the next step after the Kerala Board 10th Result 2019 is out. But there are some students who are not able to score passing marks in the examinations. The Kerala Board also has an option for them. They are now no more going to lose their entire year. By taking up the supplementary examination, the students who didn't qualify for this exam will be able to proceed further by just appearing for the exam of subjects they have failed in. Students are advised to bookmark this page for any update on the Kerala Board 10th Result 2019; they can also fill in their details on the link shared in this article to receive notification in regards to the Kerala SSLC Result 2019. Following the declaration of Kerala SSLC Result 2019, the HSE Schools will commence the admission formalities for admission of the students to Class 11. Students awaiting their Kerala 10th Result 2019 for the SSLC Exam are advised to stay alert about the admission notification for different +2 Schools. In order to complete the admission formalities, students will need their original marksheet for SSLC Result 2019 and other documents. After SSLC Result 2019, students will also have to decide the right stream that they must choose as per the score in the SSLC Result 2019. Students can find a lot of information related to new and upcoming career options and expert advice by career counsellors on Jagranjosh.com. The Kerala State Education Board is also known as the Kerala Board of Higher Secondary Education. It is located in Thiruvananthapuram, Kerala. The state Education Board was established in the year 1990 to restructure the operations of Secondary and Collegiate Education in Kerala. There are quite a few private and government schools associated and affiliated with the Kerala Board. The SSLC and the HSC Board exams are conducted by the Kerala Board every year and the results are declared by the board as well. The certificates are provided to the qualified students by the Kerala Board. The official website of the board is www.keralaresults.nic.in. Apart from the SSLC examination, Pareeksha Bhavan also conducts other examinations, for certification of qualified teaching faculty through KTET and other similar examinations. The Kerala SSLC Result 2019 will be accessible through the official website of Pareeksha Bhavan. A class 10 girl from Kerala has received attention from Ananad Mahindra for she rode a horse to reach the exam venue during her final exam. Know the details here. The Kerala Board Senior School Leaving Certificate or SSLC Result 2018 has been declared by the Kerala Board of Public Examinations on their official website, i.e. kbpe.org and keralaresults.nic.in. The Kerala SSLC Results 2017 is announced by the Kerala Pareeksha Bhavan today at 2PM. The SSLC Results 2017 Kerala is now live and available online on official website keralaresults.nic.in and keralapareekshabhavan.in. The Kerala Results 2017 is also available on Saphalam Mobile App launched by the Kerala Board.